This recipe should be called "saving a mistake". I was attempting to make Japanese rice balls which are called onigiri. These cute little balls are usually shaped into rounds or triangles by hand with a filling in the center. They are then wrapped in plastic wrap or Nori, strips of seaweed, and then kept in the refrigerator for quick lunches or snacks. Trust me when they say sticky rice, they mean sticky rice! I tried to form the balls which should have stuck together so I could push the fish filling into the rice. This is where it all failed. I even tried smooshing the mixture into little silicon molds to no avail. Dogs have difficulty digesting the starches in rice which is why I use parboiled rice or soak my rice first. Hence, no onigiris for Kirby. I had to improvise to try to save the ingredients so I dumped everything back into the bowl. I knew adding a couple of eggs would work as a binder which indeed saved my cakes. 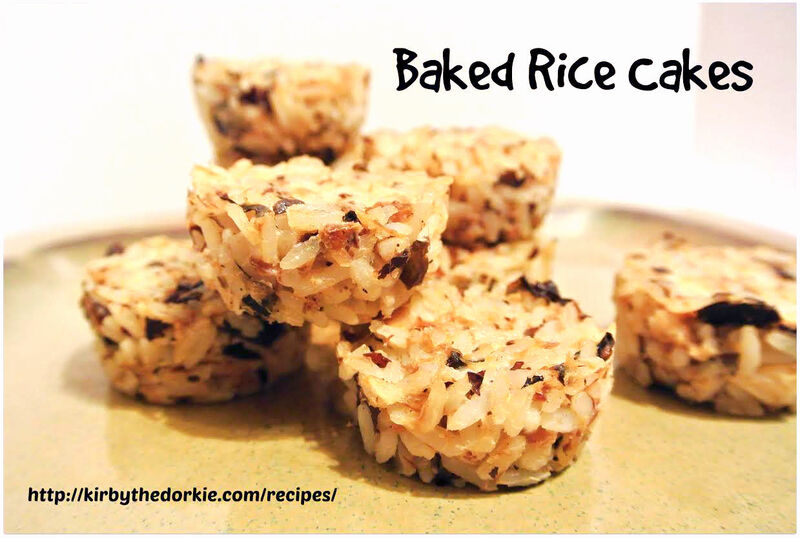 I suppose these would be a cross between an onigiri and an arancini, an Italian rice ball. A match made in heaven? In a small bowl mash the mackerel and herring. You can use canned tuna if preferred. When rice is done, mix in the kelp which has been finely chopped. It can be dried or you can cook it which is what I do by placing the strips in a pot of water, bringing to a boil and then simmering for 20 minutes. Add the beaten eggs and mix thoroughly. I found this easiest to do with my hands. Tightly press mixture into mini muffin tins to the top. Bake at 350 degrees for 20-25 minutes until the tops are crispy and browned. These will keep in the refrigerator for up to a week and in the freezer for three months! What do you think of this tasty oriental dog treat? Let us know in the comments!